Please read the below release regarding Auto-Owners Insurance's superior financial strength (which we provide through UIC). Homebuilders in the South often do not consider the threat of freezing weather and thus place water pipes in vulnerable locations. Houses built on slab foundations, common in the South, frequently have water pipes running through the attic, an especially vulnerable location. In addition, Southern homeowners experience relatively few severe cold spells, so they don't consider freezing a problem and don't bother checking the condition or location of pipes in their homes. In the North, by contrast, homebuilders know freezing is a threat, and they usually do not place water pipes in unheated portions of a building or outside of insulated areas. Southern homeowners should be aware that pipes in attics, crawl spaces and outside walls are all subject to freezing and bursting. If these pipes don't have insulation or heat to protect them, a strong overnight freeze can cause trouble. 1. The temperature of an unheated portion of a house is almost always at least a few degrees above the outdoor temperature. For example, an insulated attic may be at 37 or 38° F when the outdoor temperature is 32° F.
2. Water "supercools" several degrees below freezing before any ice begins to form. In research tests at the University of Illinois, water pipes placed in an unheated, insulated attic consistently started forming ice when the outdoor temperature dipped just below 20°F. •Seal all openings where cold air can get at unprotected water pipes. It's especially important to keep cold wind away from pipes, which speeds up the freezing process. •Leave cabinet doors open under the kitchen and bathroom sinks to allow warmer room air to circulate around pipes. •Let faucets drip slowly to keep water flowing through pipes that are vulnerable to freezing. Ice might still form in the pipes, but an open faucet allows water to escape before the pressure builds to where a pipe can burst. If the dripping stops, it may mean that ice is blocking the pipe; keep the faucet open, since the pipe still needs pressure relief. •Pipes in attics and crawl spaces should be protected with insulation or heat. Pipe insulation is available in fiberglass or foam sleeves. Home centers and hardware stores have sleeves providing 1/8 to 5/8 inches of insulation; specialty dealers have products that provide up to 2 inches of insulation. The extra thickness is worth the price and can save a pipe that would freeze with less insulation. •Heating cables and tapes are effective in freeze protection. Select a heating cable with the UL label and a built-in thermostat that turns the heat on when needed (without a thermostat, the cable has to be plugged in each time and might be forgotten). Follow the manufacturer's instructions closely. •Exterior pipes should be drained or enclosed in 2" fiberglass insulation sleeves. •Pipes leading to the exterior should be shut off and drained at the start of the winter. If these exterior faucets do not have a shut-off valve inside the house, have one installed by a plumber. Most building codes now require homes to have adequate protection for pipes, but many plumbing installers are either not aware of the requirements, or simply disregard them. Additionally, many houses were built before the codes required such protection, and thus remain vulnerable. Article courtesy of the Weather Channel. Source: Institute for Business and Home Safety. IBHS is a national nonprofit initiative of the insurance industry to reduce deaths, injuries, property damage, economic losses and human suffering caused by natural disasters. Austin Johnson and associate, David Ramage of Upstate Insurance Consultants cut the Laurens County Chamber of Commerce grand opening ribbon on Tuesday, November 12. 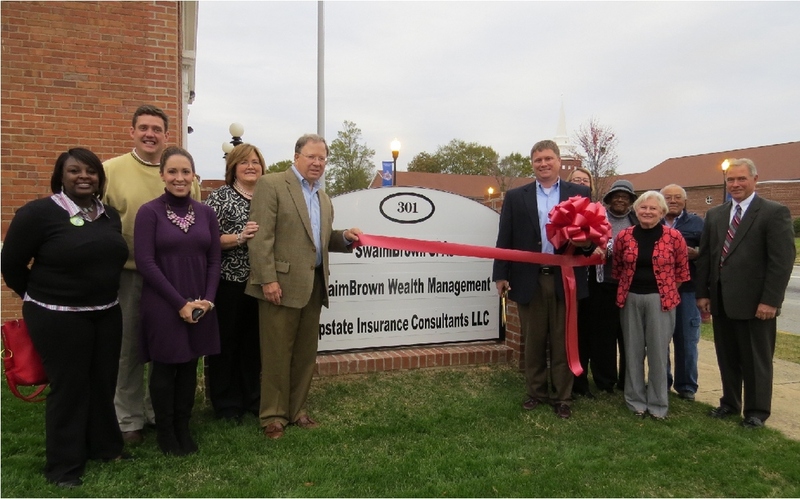 This business, located at 301 A North Broad Street Clinton, looks forward to serving Laurens County.